At last a fully adjustable suspension system for the FOCUS RS. Not content with the limits of the Standard Ford or H&R suspension systems,Pumspeed have been testing the new top of the line Focus RS variant 3 system in stainless steel. We are happy to offer the only fully adjustable system on the market. The Pumaspeed Workshop team are ready to fit the KW V3 Coil over suspension kit - Focus RS Mk1 in our Head Office located here. Therefore making parts and labour a total cost £1,658.99 (inc. VAT). 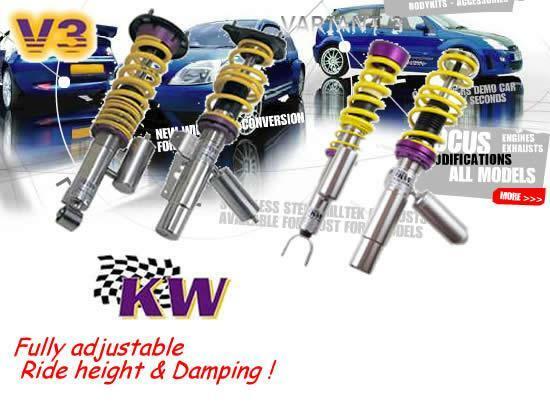 Pumaspeed have a specialist distribution team that can dispatch the KW V3 Coil over suspension kit - Focus RS Mk1 to any destination worldwide.